Ambassador Robin Renee Sanders’ new book on “The Rise of Africa’s Small & Medium Size Enterprises” (SMEs) is an insightful examination of the dramatic shift in the development paradigm for Sub Saharan Africa – driven in large part by the imaginative, innovative and insta-impact leadership of the region’s small businesses or SMEs. “SMEs have helped drive economic growth and aided in increasing the size of the Continent’s middle class,” Sanders says. The book’s Introduction is by renowned civil rights leader Ambassador Andrew Young, and the Foreword is by Africa’s leading businessman, Mr. Aliko Dangote. Sanders’ credits the determination of Africa’s SMEs to step into the void left by 40 years of post-independence development efforts that had little impact on overall poverty reduction and job creation in the region. The book also has recommendations on what donors, the African Union, African Governments, and the new U.S. Administration can do to further assist Africa SMEs. For the US, Sanders notes that as the new U.S. Administration seeks to have markets for its goods and services as part of its efforts to reinvigorate jobs in the US Rust Belt (the Midwest Region), and as Africa SMEs expand their procurement sources and help expand the region’s manufacturing base – both efforts can be synergistic, and help stimulate America's as well as Sub Saharan African economies. There is also an extensive discussion on China called the China Factor – highlighting what it is doing in the Africa SME sector, both the big pluses, like special economic zones, the potential role of the New Development Bank, and becoming the world’s net credit lending country, as well as noting some of the things on which it needs to do better. Other areas of focus are on Africa SME women, youth, and a range of examples of the innovative small businesses on the Continent in areas as far ranging as agriculture, climate change, tourism, and creative apps to improve quality of life. Included in the book are DataGraphs from the world- respected Gallup Analytics® on the enabling environment for Africa’s SMEs and comments on the importance and impact of the region’s SMEs from other key notables such as Gallup’s Managing Partner Jon Clifton, Nigeria telecom leader and Chairman of Etisalat Nigeria Hakeem Belo Osaige, CEO of the Nigerian Stock Exchange Oscar Onyema, Chairman of Operation Hope John Bryant, CEO of Homestrings Eric Guichard, former Senior U.S. Small Business Administration official Ngozi Bell, and the Minister of Small and Medium Enterprises of the Republic of Congo, Madame Yvonne Adelaide Mougany. Dr. Frederick G. Kohun, nationally-recognized scholar of Pittsburgh’s Robert Morris University (RMU), a University Professor of Computer and Information Systems at RMU’s School of Communications and Information Systems, underscores Sanders point in the book that the impact of Africa SMEs is not only a result of technology and its mobility, but the sister relationship that these have with providing access to knowledge management for communities around the world that have helped small businesses globally transform their societies and their nations. 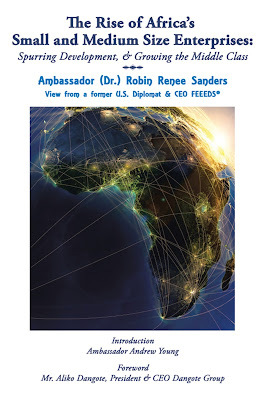 The prestigious Association of Diplomatic Studies and Training (ADST) has included Sanders' Africa SME book in its recognized series of Memoirs and Occasional Papers Series (MOPS) given its additional focus on the role and changes in diplomatic approaches to development over the ages, including the shift changes brought about by the United Nations Millennium Development Goals (MDGs) and the new Sustainable Development Goals (SDGs).